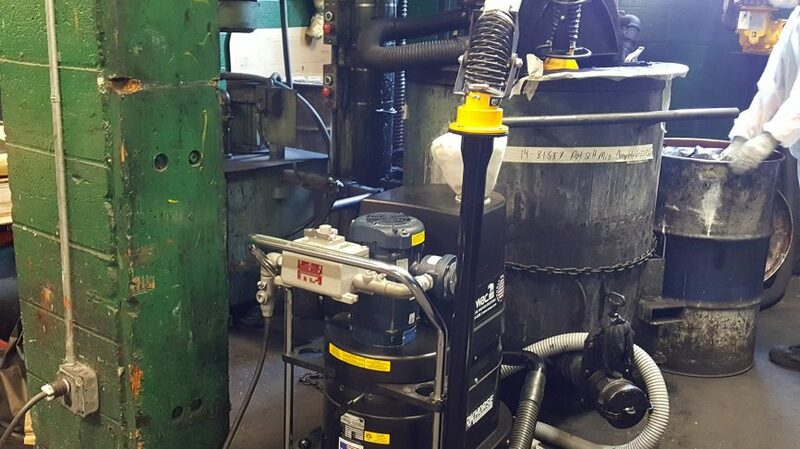 A paint manufacturer asked Ruwac USA to create an industrial vacuum system solution for its facility that would extract carbon black dust from the point of source while workers poured bags of it into their mixing drums where paint is made. These drums were 40″ diameter in width, and the bags of carbon black contained large amounts of material that otherwise creates a messy dust cloud without some kind of point-of-source extraction system put into place. Because carbon black is a combustible dust, it was very important that the paint manufacturer invested in an explosion-proof vacuum solution that would safely contain the dust during the mixing process. Ruwac’s solution was to attach a dust extraction swing arm to one of its legally certified FRV110 explosion-proof vacuum cleaners. With this system, the swing arm is able to collect dust from the mixing process into the vacuum while workers continuously pour these large bags of carbon black into the drum. The end result was that the manufacturer was able to pour 15 bags of carbon black into the mixer within 20 minutes without needing to stop to empty the vacuum. A dust-free environment was made, as residual dust was vacuumed into the swing arm’s capture hood and safely collected into the FRV110’s dustpan. In the end, this explosion-proof vacuum solution setup ultimately replaced the paint manufacturer’s need for a dust collector that would have cost them five times the amount of what the FRV110 and dust extraction swing arm cost them, with a much superior performance to bat.